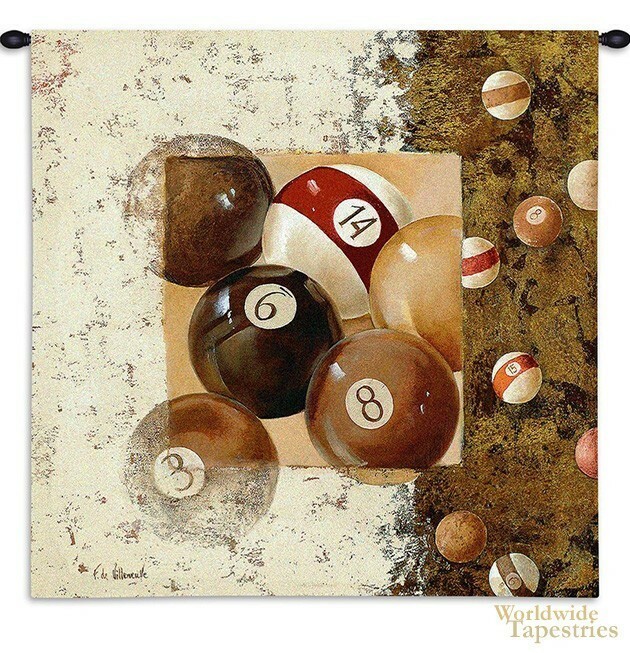 This tapestry shows an abstract design of "Billiard Balls" by artist Fabrice de Villeneuve. Here we see the billiard balls in an arrangement in the foreground as well as background in a relaxed and casual feel that is the hallmark of de Villeneuve's pieces. His works carry off an effortless feel to it which suits the subject matter here well. The use of color is again masterly as the orange, red and browns compliment each other very well. "Billiards" is a game that was first mentioned in "Mother Hubberd's Tale" by Edmund Spenser in 1591 and is a cue sport that is now played among professionals as well as at home. There are several types of billiards and here we see the American style pool balls of solids and stripes. The work is whimsical and fun yet retains the masterly use of composition and color by de Villeneuve. This contemporary tapestry is backed with a lining and has a tunnel for easy hanging. Note: tapestry rod and tassels, where pictured, are purchased separately. Dimensions: W 34" x H 34"